Cities across the globe have added a touch of LGBTQ visibility and pride by painting rainbow crosswalks on their streets. They are often temporary, put down to coincide with Pride, before being painted over and returned to their original, bland look. Some cities have decided to take a bigger stand in showing they stand with the LGBTQ community by making their pride crosswalks permanent. As we recently reported, the city of Lethbridge, in Canada, is getting both a permanent transgender pride flag crosswalk and a permanent rainbow crosswalk. They will be temporary at first, due to scheduled development in the area, but will later become permanent. Here are some that are already here, queer, and not going anywhere. The historic LGBTQ neighborhood The Castro, in San Francisco, naturally has fabulous rainbow crosswalks adorning the streets. It came to the city as a permanent feature in 2014. Another of the country’s most iconic “gayborhoods,” West Hollywood got its own rainbow crosswalks in 2012. They were originally going to be temporary, for Pride month, but the city decided to let them remain. Rainbow crosswalks came to Long Beach, California last year. “These crosswalks are not only symbolic of our LGBTQ community, but symbolic of our pride in the community as a whole,” said Vice Mayor Suja Lowenthal. In 2015, Seattle unveiled 11 rainbow crosswalks in the LGBTQ-friendly Capitol Hill neighborhood. The city pledged to maintain them for years to come. 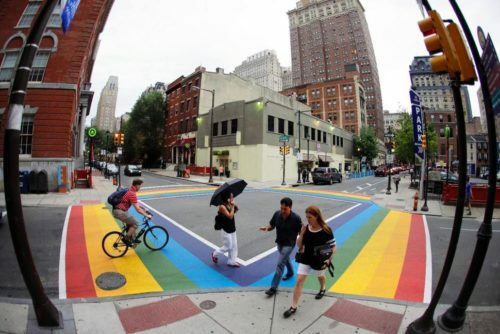 They, like all the rainbow crosswalks, are a favorite place to stop for photos, for both tourists and locals alike. Permanent rainbow crosswalks came to Key West in 2015, at Duval and Petronia streets. Not to be outdone, Miami Beach has its own proudly colorful crosswalks, at Ocean Drive and 12th streets. The city showed it off on Facebook last year. The City of Brotherly Love knows love is love. They were painted at the intersection of 13th and Locust streets in 2015, to mark the 50th anniversary of LGBTQ rights demonstrations. Toronto’s rainbow crosswalks were put down in time for WorldPride 2014. The city decided to allow them to be permanent, at Church and Alexander streets. Another great Canadian city, Vancouver, painted their crosswalks in 2013, at the intersection of Davie and Bute streets. Coun. Tim Stevenson, who was the first openly-gay provincial cabinet minister in Canada, announced the crosswalks. Mayor Jim Watson and Somerset Coun. Catherine McKenney unveiled the city’s permanent rainbow crosswalks at the intersection of Bank Street and Somerset Street West in June 2016. Saskatchewan got in on the act this year, with a crosswalk on the 200 block of Central Avenue in Swift Current. 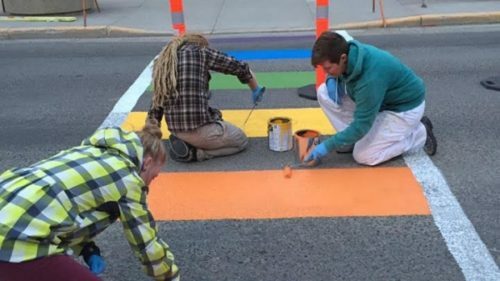 Rainbow crosswalk being painted on the street in Saskatchewan.